Use our Vegas horseback riding deal for a $16 discount on a sunset Wild West Horseback Dinner Ride just thirty minutes outside of Las Vegas. Dinner and transportation from your hotel are included. Click on your friend Coupon Puppet below to get this deal and experience the Old West! When you think of Las Vegas, you probably don’t think of cowboys, dusty horse trails, river washes, and dinner around the campfire. But what better way to take a break from the glitz, glamour and smoke-filled casinos of Sin City than a brief escape to the Old West? When you book a Wild West Horseback Dinner Ride, you will be picked up from your hotel between 4 and 5PM (or 2 and 3PM in the winter months- earlier sunset, yaknow!). You’ll ride the 30-45 minute drive out of town in air conditioned comfort. Upon arrival, you’ll be greeted by ranch hands and then it’s time for horsies! Wild West Horseback Adventures gets 4.5 stars on Trip Advisor and every reviewer simply raves about the well behaved horses and friendly staff. The breathtaking sunset is also something to behold on your 1.5 hour ride. After you disembark your horsie, it’s time for dinner! No avocado mousse or “craft cocktails” here! Meat and potatoes and apple pie are on the menu, among other delicacies. You’ll end your Old West adventure chilling out by a campfire before being chauffered back to your hotel. There are definitely worse ways to spend $143 and 5 hours. If you want to take advantage of a Vegas horseback riding deal but are afraid a sunset ride will make you late for da club, you can save $13 on an Ol’ Spanish Trail Lunch Ride instead. Early risers can save $13 on the Maverick Breakfast Ride as well. All the Wild West Horseback Adventures are perfect for the whole family, provided the whole family is at least six years old and less than 250 pounds. 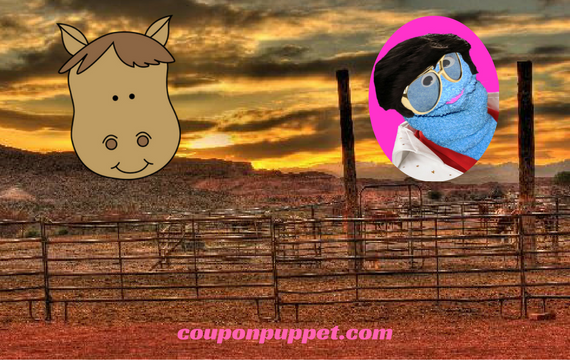 Coupon Puppet Loves Finding You A Great Vegas Horseback Riding Deal!